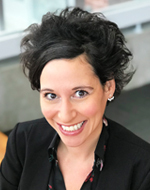 Christy Agnese joined Albright College in July 2016 and has been serving as the vice president for advancement since June 2018. The Albright College Advancement Division builds relationships and creates connections by engaging alumni and friends, establishing strategic partnerships, and facilitating opportunities for philanthropic support to connect individuals to the mission of Albright College to further its educational and operational goals. Before moving to Berks County, Christy worked at Ithaca College in the School of Music overseeing their external relations and operations, as the executive director for Habitat for Humanity in Tompkins and Cortland Counties, and at The Philadelphia Orchestra, with roles in education and community partnerships and in major and planned giving. A native Pennsylvanian, she earned a bachelor of arts in music from Ithaca College and a master of science in arts administration from Drexel University. A graduate of the HERS Women’s Leadership Institute and Leadership Berks, she currently serves on the Berks Community Health Center Board of Directors, Pennsylvania American Council on Education (PA ACE) Women’s Network Executive Board of Directors, and Ithaca College Alumni Association Board of Directors. Christy serves on Albright’s President’s Council on Wellness and, not surprisingly, her favorite place on Albright’s campus is in the Schumo Center for Fitness and Well-Being. Christy is passionate about bringing people together to move Albright forward to achieve its strategic goals and further its mission. Rick Ferry has served as head men’s basketball coach since joining Albright in 2001 and was appointed co-director of athletics in 2009. A 1985 graduate of Susquehanna University, Rick started his professional career in accounting, working as an auditor for KPMG for three years. After earning an MBA in finance from Ohio University, he started his coaching career at Susquehanna University as a part-time assistant coach. He also worked in the Business Office as the controller. Rick was hired as the head men’s basketball coach at Juniata College in 1996 and worked there until joining Albright. Rick serves on the NCAA National Basketball Committee and the Board of Directors of the Reading Berks Basketball Association. He is a former Congressman for the National Association of Basketball Coaches. 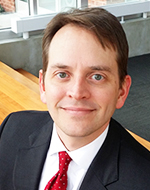 Gregory L. Fulmer, CPA, has served as Albright’s chief financial officer since March 2014. Greg oversees all financial aspects of the College, including budget development and management, investments and endowments, payroll, facilities management, insurance and risk management, legal affairs, human resources and certain auxiliary services. Greg has more than 23 years of progressive financial management, planning and analysis, and accounting experience, including more than 11 years of experience in higher education. Prior to joining Albright, he served as associate vice president for finance at Franklin & Marshall College in Lancaster, where he led the development and management of the institution’s annual operating budget. 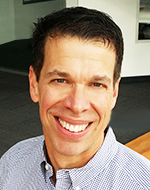 In addition, Greg has also worked in the corporate sector, at several regional companies, including MDS Pharma Services in King of Prussia, Cigna Corporation in Philadelphia, and Unisys Corporation in Blue Bell. A certified public accountant, Greg began his career in public accounting serving clients in various sectors, including higher education. He holds a bachelor of arts in business administration from Franklin & Marshall College. Janice Luck is no stranger to the Albright family. Janice is a 1996 graduate of Albright College. In her time as a psychology and business student she was captain and member of both the field hockey and women’s basketball teams. While completing her master’s in sports administration at West Chester University she served as an assistant coach for the Rams. 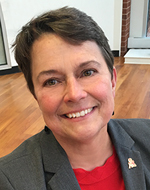 In her return to Albright, Janice held positions in the admission and the advancement offices. In 2002, she was named head women’s basketball coach and was appointed co-director of athletics in 2009.Janice has held leadership positions and served on various committees for the Middle Atlantic Conference, the Women’s Basketball Coaching Association and the NCAA Regional Committee. She also serves on the PA Sports Hall of Fame, Berks County Chapter Committee. Rashmi Radhakrishnan is the vice president for digital strategy and chief information officer (CIO). 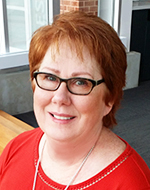 She joined the college in 2013 and has over 20 years of experience in higher education. 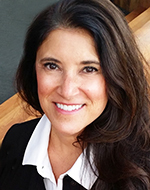 Her experience includes driving mission-critical technology initiatives by advancing collaboration with campus leaders, executive management and key stakeholders to gain the necessary buy in. 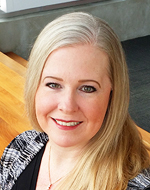 She is responsible for all aspects of technology on campus including client services, enterprise applications, enterprise data, instructional technology, information security and infrastructure. Prior to Albright, she was the associate vice president for information resources at Philadelphia University. Throughout her career, she has led many successful teams and projects, many of them mission critical to the institution. She has been able to drive successful organizational change due to her responsive and collaborative leadership style. She derives great satisfaction from empowering faculty, staff and students with solutions that allow them to excel in their areas. 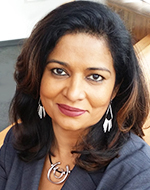 Rashmi is an active member of EDUCAUSE and has served on committees including the conference program committee and the security conference program committees. She is an innovator at heart and was awarded the Philadelphia Business Journal, Top IT Pro in 2013 for her work with business analytics. She has a master’s degree in instructional technology from Philadelphia University and a bachelor’s degree in business. Jennifer Stoudt loves to tell stories – Albright stories! For the last 20 years she has honed her skills as a writer, editor and strategic-thinking communications professional at Albright College. Jennifer joined Albright in 1998 after three years as communications manager for a nonprofit, economic development company in Wilmington, Del. She brought with her to Albright a love for writing, a passion for telling stories and an energetic commitment to being a part of a higher education community. She has served in numerous roles within the Communications division (formerly known as College Relations & Marketing), working in editorial services, publications management, media relations, photography and as editor of the award-winning Albright Reporter magazine. In her role as vice president, she enjoys leading a team of talented creative professionals in the implementation of clear, consistent and engaging strategies that enhance public understanding and support of Albright College, its people and its value to the world.Jennifer earned a bachelor’s degree in communications from the University of Delaware and is an active member of College and University Public Relations and Associated Professionals (CUPRAP). She was the 2015 recipient of Albright College’s Edward R. Gilbert Annual Pride Award. Samantha J. Wesner, D.N.P., C.R.N.P., R.N.C. During her 20 years at Albright College, Samantha Wesner has found her passion for creating and bringing new wellness initiatives to the college. 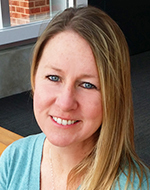 Her knack for creative problem solving has led to many new initiatives at the college, including the development of community partnerships and the successful acquisition of grants to address high-risk drinking behaviors and Title IX related behaviors. Samantha earned a diploma in nursing from Lancaster General Hospital School of Nursing; an associate degree of science from Franklin and Marshall College; an obstetric and gynecologic nurse practitioner certificate from Planned Parenthood Federation of America, Inc., Family Planning Council, University of Pennsylvania School of Nursing; a bachelor of science in nursing from Eastern University; a master of science in nursing from Drexel University; and a doctor of nursing practice from West Chester University. In 2008, she was a recipient of the Albright College Pride Award. Samantha is a member of the Richard J. Caron Foundation’s Central PA Advisory Council.